Although Apple’s September 1st event may have stolen all the attention, SanDisk also had an announcement the day before. The company, which is well-known for flash memory cards, announced the Sansa Fuze+ MP3 player, an upgrade to the older Sanza Fuze. Despite a sub $100 price tag, the media player boasts a few features that even the latest iPod Touch lacks. The redesigned Fuze+ offers plenty of capacity for multimedia storage. While the device is available in 4GB, 8GB, and 16GB capacities, it also supports microSD expansion for additional storage. There’s a 2.4 inch 320-by-240 pixel (QVGA) LCD screen and a capacitive touch control to navigate the new “Film Strip” interface. A few featured icons are Music, Video, Podcasts, FM Radio, and Photos. Simple swipes offer directional controls and double taps perform actions. While the Apple iPod Touch supports a variety of formats, it lacks the ability to playback FLAC, OOG, and WMA. 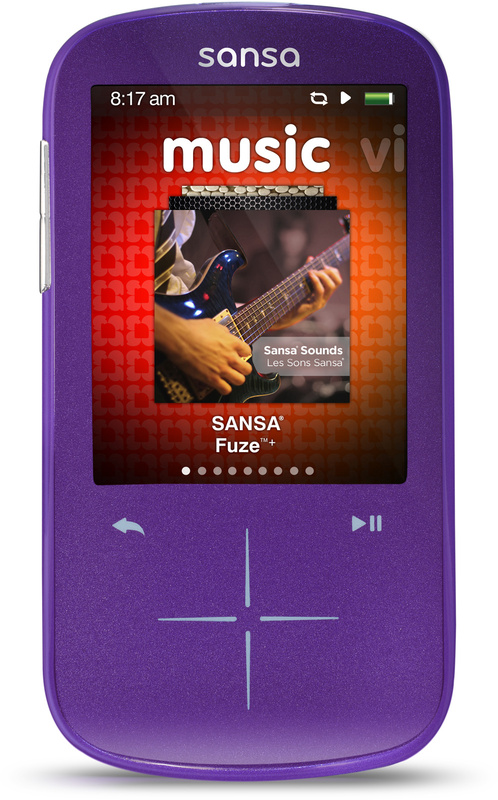 The Sansa Fuze+ supports the those in addition to MP3, WAV, and even AAC. When it comes to video, like the iPod Touch, SanDisk offers support for H.264 and MP4. (Plays WMV too.) And for those who care to store photos on the Sansa, it can render populate image formats including JPG, PNG, BMP, and GIF. The rechargeable battery enables 24 hours of audio playback and 5 hours for video. There’s also a built-in FM Radio and a microphone for use as a voice recorder. According to SanDisk, the unit will be available in red, white, black, blue, and purple. While the Sansa Fuze+ doesn’t offer video chat, cameras, thousands of applications, a high-resolution screen, WiFi, or simplistic design of the iPod Touch, it’s still gets the job done when it comes to basic media playback. Although the MSRP is $79 for 4GB, $89 for 8GB, and $119 for 16GB, pricing in retail stores is likely to be much cheaper. Since it’s 2010, I’d highly recommend saving up to purchase a robust all-in-one smart phone, however for those on a tight budget, the SanDisk Sansa Fuze+ is a great alternative. I love sansa`s players! you can check the review that i wrote on my site! This is like the ultimate MP3 player – touch 2.4″ bright QVGA screen, SD expandable, FM radio and high quality music playing. Because of that I’ve already ordered it from http://amzn.to/aHC80a , it cost me just 80$ (the 4GB version) – I will add a 16GB SD card which costs around 24$ instead of buying the 16GB version for 120$.